To Register for an event click the button title to be redirected to more details and how to sign up. ​To book a private event, retreat, or workshop at Villa Gaia, Ubud, Bali - please go to the Rental page. As with the five elements in nature, this retreat curated by Naima Woodson of www.beachbumwisdomco.com has been thoughtfully orchestrated with each element creating the other and working together to support a beautifully balanced vacation experience. 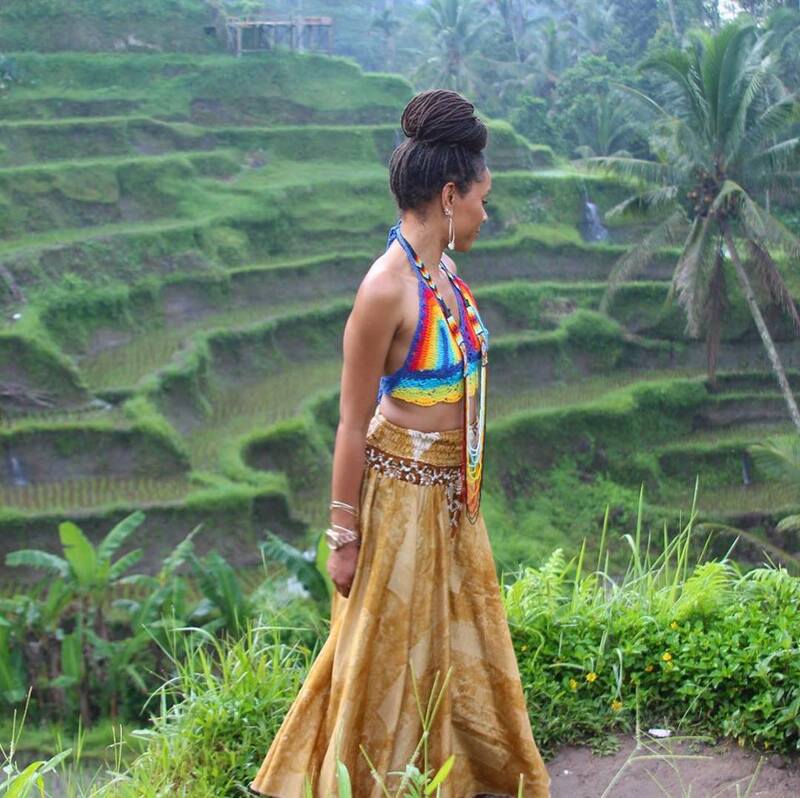 Aside from Bali being one of the most high vibration, spiritually magnetic, lush, naturally and culturally beautiful places on earth, her love of the culture, food and spas inspired her to create a retreat where you can deeply nourish yourself, indulge, and have fun with kindred spirits. You will see amazing sights, explore majestic temples, splash around in the crystal clear sea, sip cocktails on white sandy beaches with stunning sunsets, eat fresh and organic regional cuisine, get massages and more! On this all-inclusive journey, you will have some time on your own to explore the island. Spend a half-day at the spa for a relaxing Ayurvedic body treatment and fragrant flower blossom bath, wander through rice fields, shop the colorful markets, splash around in a waterfall, take a yoga class, visit the Monkey Forest, check out the night-life.After all, this is YOUR time to feed your mind, body and soul, as you wish. 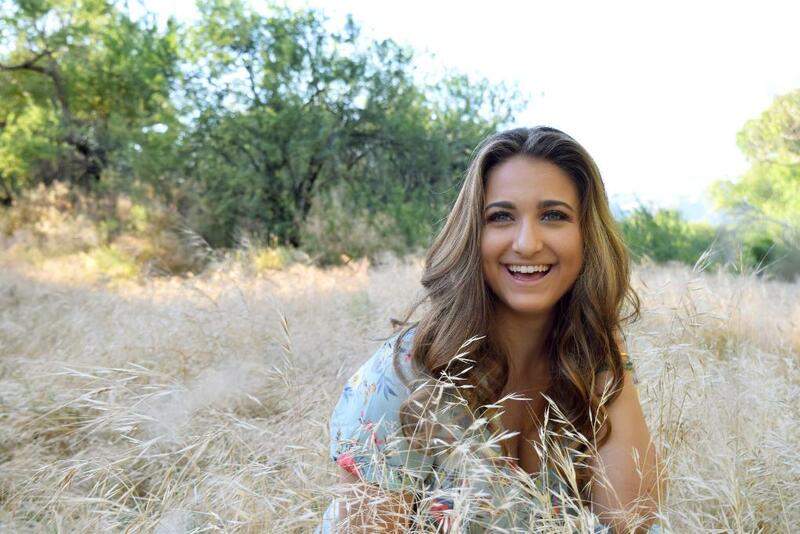 View Naima's past retreat at Gaia Retreat Center by clicking - here. As women, we are always giving. It may be to our family, our partner, work or community. How long has it been since you have paused and recognised that your cup may be a little empty? How long since you have taken time for yourself? The Kindred Women Yoga Retreat offers women a place to replenish, open and grow. This retreat is to help you connect with your deepest wisdom and recharge on every level. A sanctuary in which to take a balanced yoga practice every morning, time during the day to explore, reconnect with yourself or be pampered and a healing yin yoga and guided meditation every afternoon. Within the deeply nourishing space of Villa Gaia, you are offered yoga and meditation practices, guided by senior teacher Nadine O’Mara and art therapist / yoga teacher Krystle Maguire, that are accessible to all levels whether a beginner or established yoga practitioner. A stronger morning asana practice based on vinyasa principles to invigorate the body and breath while the evening’s practice allows deeper work not only physically but allowing the opportunity to turn inward - to tune back into your inherent feminine strength through guided meditation and breathwork (pranayama). You also have the chance to go deeper via an art therapy workshop, visit historical temples and holy waters.. Most importantly, you will have ample time to just be. To quietly walk through the rice fields, read a book, rest, swim. Space for self reflection can often be the greatest healer or encourage the most divine growth.This is an opportunity for women of all ages and all abilities to come together. As women we don’t connect across generations often enough, the wisdom of those older and the inspiration from those younger becomes lost. Allow yourself to connect with other women in a soulful, nurturing way while also having the time for personal self exploration. Now is your chance….This is your time. Gift yourself an opportunity to replenish. A opportunity to nourish and a magical way to fill your cup. Nadine O’Mara is a senior yoga teacher (YA) in Sydney, Australia, who has brought her unique blend of yoga to women of all ages while in India, America, the UK and Australia. She is passionate about supporting women and has done so through some of the most challenging moments in women’s lives. She facilitates women’s circles, runs workshops in women’s self care and holistic birth education and supports women during birth as a doula. Her training and influences in yoga are far and wide and her teaching reflects that. Nadine recognises how much, as women, we give to society and so is passionate about encouraging women to find space for nourishment and self “rediscovery”. Krystle Maguire has a natural and unique ability to lift and shift her students energy. Her positive vibration and cleverly crafted yoga classes draw her students in and enable them to travel on a journey of self discovery through mind, body and soul. Krystle teaches many styles of yoga including kids and teens and runs her own home yoga studio on Sydney’s Northern Beaches. Her passion however lies with her Yin teaching. She believes Yin Yoga is medicine for the modern world. A simple practice for every body to slow down, tune in, let go and wake up. Inspired by her Ashtanga teachers Manju Patthabi Jois, Kino Mcgregor and Tim Feldmann, Vanessa Coomans (RYT-200) hailing from Belgium, invites you to immerse in her 7 nights retreat - offering a perfect balance of dynamic Ashtanga yoga and cooling Yin yoga. The ebb and flow of her Yin & Yang theme is designed to generate heat and blood circulation that strengthens, purifies and revitalizes the muscles and internal organs of the body while eliminating stagnation from daily life, melt away muscular tension and sooth the nervous system. Vanessa's yang classes are known to be powerful, sweaty, fun and challenging - but always with full respect for every 'body' and their limits. Her therapeutic sunset yin classes will offer gentle breathing and deep long held stretches. This retreat is open to all backgrounds! Margot has been practicing Yoga, the art of flowing with your natural energy cycles and slowing down, for over 20 years. Curious and playful by nature, she was initially drawn to the graceful dance-like movements of yoga though now sees movement as a healing modality, a precious opportunity to tune into the rhythms of nature and into the wisdom within. Margot communicates, shares and connects easily with people from diverse backgrounds with her warm and caring approach. Sharing this powerful and profound practice is her passion as it offers a way in, to ground, to be creative, to connect to what is important: compassion, kindness, love, and perhaps the most challenging, the act of letting go – for nothing is permanent. • Discounted spa treatments- massage, facials, reflexology etc. See the power of community and connection when cultivating self-love and creating confidence in your life by forming a sisterhood in a sacred, welcoming, and accepting environment... You'll spend the mornings in workshops with Mary on healing food and body-image struggles; the afternoons going on adventures to experience Bali's most beautiful landmarks; and the evenings in a sacred bonding space with your fellow retreat sisters. Saltwater pool, sauna at your disposal as is the vibrant village of Ubud, the artistic and cultural capital of Bali. Mary, founder and owner of Mary’s Cup of Tea, will be your guiding force on this deep and transformational self-love journey. Mary is a former bikini fitness model and competitor turned self-love and confidence coach. After healing from many physical and mental health complications, she committed her life to changing the notion of health, fitness, and beauty into one that inspires you to love yourself first. You can read more about her on her blog: maryscupoftea.com and on Instagram as @maryscupofteaa. During the retreat, Mary will be hosting daily workshops for you and your retreat sisters on healing body-image struggles, transforming your relationship with food, cultivating self-love and creating confidence in your life. You'll also have private 1-1 coaching time with Mary to make for a powerful and transformative retreat experience. Michelle and Dina invite you to take a moment to reset, re-centre and rev up your practice. Whether you are newer to yoga, or you are looking for the opportunity to deepen your connection to it, this retreat will provide you with the perfect platform for personal yet guided exploration of the mystical practice. Embark on a journey with two unique and experienced yogis in a safe and uplifting environment. Expect to be challenged, but yet supported physically, emotionally and spiritually. Anticipate classes to be vigorous but open to all levels with hands on assists to help each participant reach their fullest potential. Morning sessions will be centered around the Ashtanga or Jivamukti Yoga method while evening classes take the form of a gentler, yin flow. You will have the chance to build up your physical practice, embody key alignment principles, learn the fundamentals of meditation and walk away with knowledge of select yoga scripture and philosophy. Dina is a Jivamukti Yoga 300 Hour Certified Teacher and has been sharing her passion through teaching since 2015. She stumbled across yoga at the age of 15 through a Gaiam home video bought on Amazon and has been hooked ever since. She also offers Ashtanga, Thai yoga massage, meditation, and prenatal yoga. At heart, Dina dedicates her teaching and her practice to help spread joy and compassion to all - making yoga accessible through a safe and uplifting environment. With a personal practice exceeding two decades, Michelle can't imagine or even remember much of life without yoga. She first began teaching yoga in 2004 and is certified with 500hours Yoga Alliance as well as secondary group ashtanga certification from Mysore India. Michelle's often challenging classes mirror her philosophy that it is easy to be calm if everything around you is calm, but can you maintain that inner calm and steady breath when you are being challenged? Kunkanit Phrombut (Joy) from Thailand and Ricardo Martin from Venezuela are co-directors of Bright Yoga School. They have created their school with the idea to support yoga practitioners all around the globe who want to bring their Ashtanga Vinyasa Yoga practice into a complete new level, and also for those who want to share the love and the passion of the practice with others through teaching. They are now embarking to lead an Ashtanga & Vipassana Retreat at Villa Gaia in July ~ welcoming students who would like to start or deepen their Ashtanga Practice, perfectly balanced with Vipassana meditation, nourishing meals & cherry picked excursions. This retreat is suitable for anyone who wishes to start the Ashtanga practice with a solid foundation and for those who already have experience in the Ashtanga method. 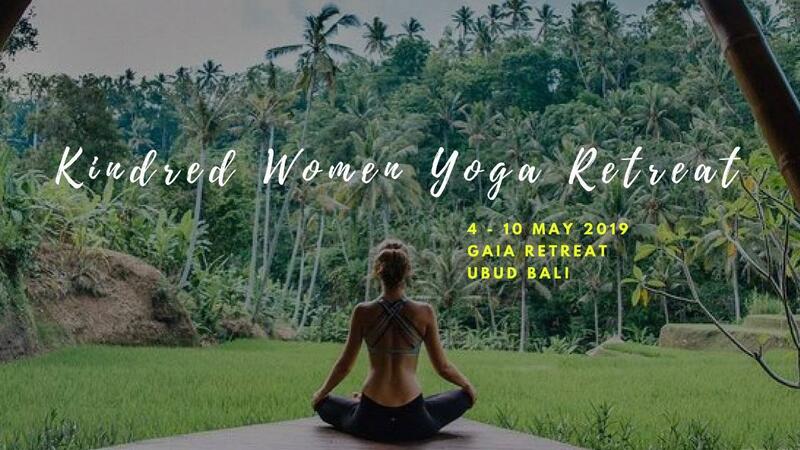 Combining this retreat along with Joy and Ricardo's 100hr intensive at their following second destination in Bali, will allow you to receive a 200hr Yoga Alliance Certification. Joy took her first Yoga Teacher Training Course in 2007 with Absolute Yoga Thailand, and obtained her 200 Hrs Hot Yoga teacher certification. Since then she has been inspiring and sharing her passion with all those who are interested. In 2009, she travelled to the United States for 6 months to study with Doug Swenson, one of the famous Yoga teachers in the West. While there, she was also given the chance to be his Yoga Assistant for The Yoga Conference Canada as well as many yoga workshops in the USA. In 2010, she took another Yoga Teacher Training with Larry Schultz, the founder of It’s Yoga. This time it became a transformative step in her life. When she certified 200 Hrs Ashtanga Vinyasa Yoga Teacher under Larry Schultz, she began her career as a Trainer. Ricardo started to practice Yoga almost 10 Years ago back in his home town in Venezuela. Rocket Yoga was the yoga style which first grabbed his heart, from where he moved on to Vinyasa Flow Yoga. After completing his Yoga Teacher Training with Larry Schultz, his practice locked on to Ashtanga Vinyasa Yoga and Rocket Vinyasa Yoga exclusively. Vipassana meditation is also part of my practice, I have been practicing meditation during the last five years. Meditation practice is a key ingredient to understanding the subtle aspects of the practice, so we include this very much in our approach to the practice; so more than teaching asana we teach mindfulness in movements. Meet Erika Cramer, founder of Queen of Confidence in Australia, who is taking a bold stand for women to reclaim their self confidence. She encourages women to end people pleasing, self judgment, comparison and to let go of caring so much what other people think of us. Joining her is husband Hamish Cramer, founder of Manfulness who brings a deep level of holistic experience, meditation and personal fitness training designed to inspire the Mind, Body and Spirit connection. This highly anticipated co-facilitated 6 day retreat for women will be based on working with the mind, thoughts, feelings, beliefs and behaviours via modalities of coaching, mindfulness, cognitive behaviour therapy, shamanic healing, movement, meditation & neuroscience to inspire action, change, connection and deep compassion and acceptance of self and others. Here you will be safely guided and lead in order to push past comfort and into the rebirth of you are really meant to be. This retreat will leave you feeling, energised, rejuvenated, clear minded, expanded and ready to experience yourself on a whole new level. Erika speaks regularly to groups of women and mothers on the topic of Self confidence, Self-love and vulnerability. She facilitates Confidence masterclasses in Melbourne whilst running her coaching business where she coaches women both privately and in groups settings. Erika keeps it raw, real and entertaining whilst inspiring women everywhere to be who they are and stand in their fully expressed selves. Hamish sees fitness and wellness as one and focuses on empowering his clients into movement versus weight loss. This unique approach to fitness incorporates meditation in order to assist his clients in achieving lower stress, adrenal and cortisol levels. Hamish is a long life learner and has studied energy healing and Shamanism, which he incorporates into all of his sessions. 2 x One on one Video call Before and after the retreat to connect, support and nurture you through your experience. "Nourish You Singing Retreat" is a unique way to explore at a deeper level, our own voice and the stories we have around it. Within a supportive group environment we can shift, find and connect with a more authentic singing voice and experience the joy that comes in singing with others. Within a beautiful environment and being deeply nourished by others, you are freed up to re-connect with yourself and with other kindred spirits! Over the last 20 years, Betsy has been a Choir Director and Workshop Facilitator and has run music programs for Youth and she is passionate about what she does!! Betsy takes great pleasure in creating choir arrangements by taking amazing songs and making them unique by creating a new version with 4 part harmonies and a range of different instruments or A cappella. Daily singing sessions with Betsy Hanson - fabulous contemporary, world music and indigenous songs with gorgeous harmonies, exploring your voice, what it means to you to express yourself through singing as well as working together as a group to improve your skills and confidence. Whether or not you consider yourself a singer, you will discover a deeply important part of who you are as you immerse yourself in song and bring your music to the surface and out into the world. Group sessions facilitated by Betsy Hanson and Milinda Rodziewicz - sitting together in a circle, you will have some thought-provoking discussions and honest, gentle conversations about authenticity, beauty, music, creativity, feeling good and learn a little more about how to ask ourselves better questions in order to move through life's sticky moments! Sharing your collective experiences and wisdom, you will come away with some great new ideas/thoughts/tools that will support you on your individual journeys. 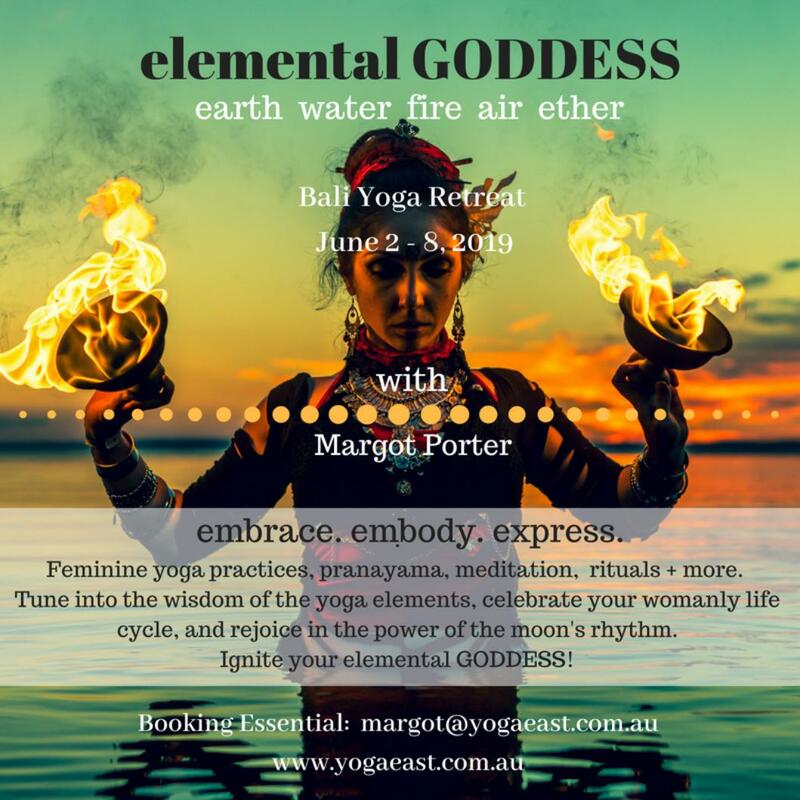 Join Melissa Ghattas on an inspiring retreat revolving around the "five great elements", found in the Vedas, especially Ayurveda, bhūmi (earth), jala (water), agni (fire), vayu (air or wind) and akash (aether or void). Each day will begin by creating healthy rituals to embark on our journey within. 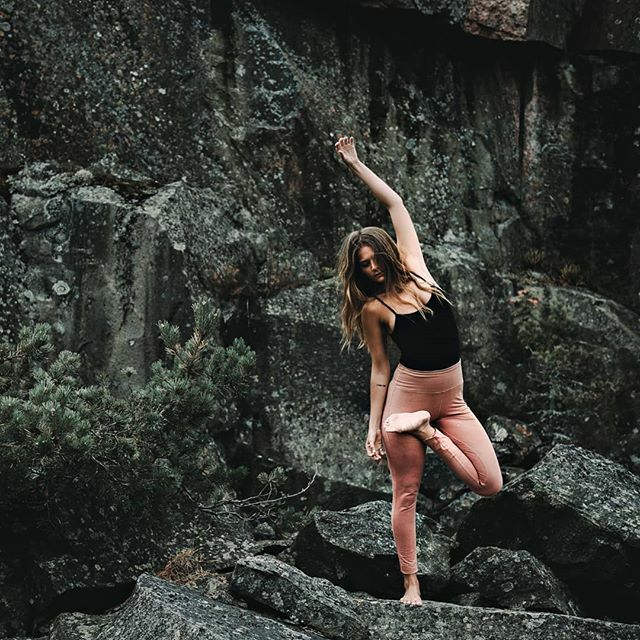 Using the ancient teachings of the 5 elements we will embody a daily vinyasa flow practice that will reinforce our connection to Nature. Recreating stability, fluidity, creativity, confidence, love, truth, clarity, wisdom and harmony. The afternoons will vary between sound healing, yin, walking meditations, sacred dance, internal reflection, journaling, sharing circles, creative writing/drawing, reading, connecting with friends or spending time by the pool. Our experience will be deepened by the picturesque landscapes, sounds of birds and silence. The Balinese are known to be humble, respectful & compassionate; the epitome of spirituality. Bali is a devoted spiritual culture, everything is an offering to the Gods & here we will learn & grow together. Discovering yoga in 2005 during a transitional period of her life, Melissa left her previous career and immersed herself into her practice in Mysore in 2009. India provided a transformative experience where her understanding of yoga developed into a way of life, a purposeful existence and a journey towards one’s truth in which she intends to share the same with her teachings. In 2010, Melissa traveled to the Brahmani Centre in Goa for a series of teacher trainings with Julie Martin and has since been teaching Vinyasa flow in Dubai. Melissa maintains her seasonal teaching travels to India and now assists Julie Martin in both level 1 and level 2 teacher trainings giving her the confidence to share this passion with others. Melissa continues to expand the scope of her training both as a teacher and as a student, by embarking on various training and self-development experiences around the world each year. This has allowed Melissa to deepen her empathy-driven style of teaching with the likes of Julie Martin, Shiva Rea and Rolf and Marci Naujokot, and share her inspiration and encouragement with her students. 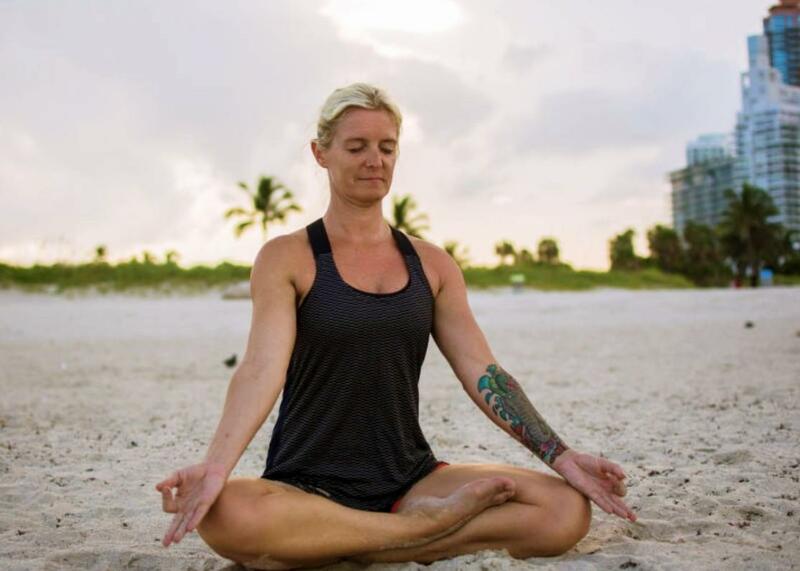 Melissa is currently a Liquido ambassador and an experienced E-RYT 500 yoga teacher known for her dynamic Vinyasa flow classes and her integration of yoga philosophy into everyday life. A place to unravel, open & bloom. This profound, down-to-earth 7 day retreat led by Uma Spender is designed to help you connect with your deepest wisdom and recharge on every level. Each day we will immerse in the sacred feminine; explore the ancient wisdom of the Goddesses of Yoga Mythology and cultivate presence in our modern lives. A hike up Mt Batur to watch the sunrise and a water ceremony at Sebatu led by local Balinese priestess Luh Manis are just some of the unique highlights! - Delicious & Healthy meals all day, every day during your stay - all requirements catered for. Returning back to Gaia Retreat Center, is Morgan Webert's highly anticipated and uplifting, nourishing week long retreat of inspiration and restoration! Restore and inspire your soul amongst lush jungle foliage and rice paddy fields just outside of Ubud, the yoga and spiritual centre of Bali. Drop out of busy life and into nourishing sweet surrender with daily yoga, meditation, healthy food, soul sessions, sound healings, dance, nature walks and more. 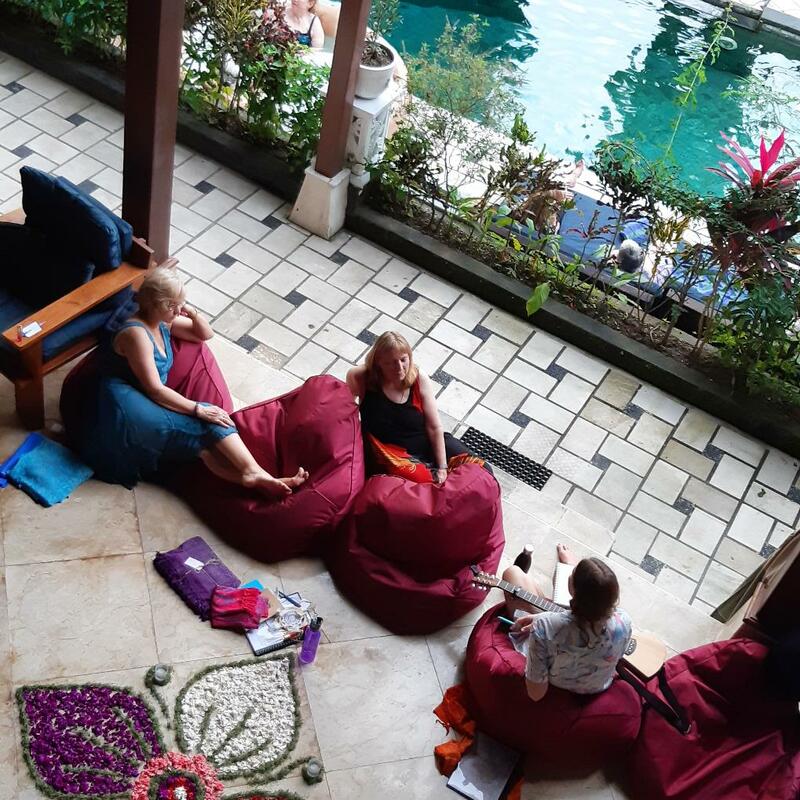 Connect with other beautiful souls and share a heart opening, spirit expanding journey into letting go of what holds us back and embracing what inspires our soul, with plenty of time to relax, read a book, get a massage, lounge by the pool, explore Ubud and take time for you. Expect daily Dynamic Hatha Yoga (every morning), followed by a daily range of meditation techniques (midday) and soulful Yin/Restorative Yoga (every afternoon) — a slow and gentle practice designed to stretch and open the body as well as deeply restore and nurture. Soul Sessions — daily workshops with Morgan will teach you tools to break through limiting beliefs, cultivate empowering habits and design a lifestyle that supports your soul long after the retreat ends. Sound Healing — Experience the power of sound healing with crystal bowls and gongs amplified by sacred architecture at the Pyramids of Chi sound healing centre and feel your entire being vibrate with vitality. Shivakali 200-Hour Yoga Teacher Training returns to Villa Gaia in Ubud, Bali - immersed in the ancient spiritual, philosophical and meditative traditions of Yoga, while also maintaining a firm ground in modern alignment, sequencing, and approaches to practice. Founded by Serge Bandura - owner of a beautiful new studio in Ojai, California, this 200hr Yoga Teacher Training progresses over 18 days by a map of the chakras, starting at the root and ending with the crown. During the root segment, students will ground their intentions for teaching/practice, and learn the vast history of Yoga from the Vedas through the Upanishads, Buddhism, Yoga Sutras, Bhakti traditions, Tantric Lineages and contemporary Yoga Schools. In the sacral chakra we will uncover the countless layers of the subtle body, learn the principles of Ayurveda, gain an overview of classical Tantra, and practice Yoga Nidra. As we progress through the navel chakra we will explore Yoga's connection with power, fire, and introduce Lakshmi practice & the business of Yoga. In the heart we encounter the devotional path of Bhakti (devotional) Yoga, as well as ceremony, prayer and healing. We will connect in nature, and receive teachings on the heart of our practice. We share in men's and women's circles as a step in our process of uniting energies, where we also honor identifying with a group other than your assigned-at-birth gender and exploring either group as you feel called. These are non-binary groups, with the awareness that classical yogic philosophy state we all have both the feminine and masculine essence inside us! Each day will also include a thorough overview in the anatomy/physiology of Yoga-Asana (postures), a comprehensive outlook on teaching methodology, an intensive dissection of major and minor poses, workshops on adjustments/alignment, and plenty of time for practice teaching. Not to mention time for students to be present in nature, reflect, swim, stargaze, and relax in quietude. This training will also include an excursion to a very special Balinese temple, and a chance to participate in a profound & ancient Balinese ritual. 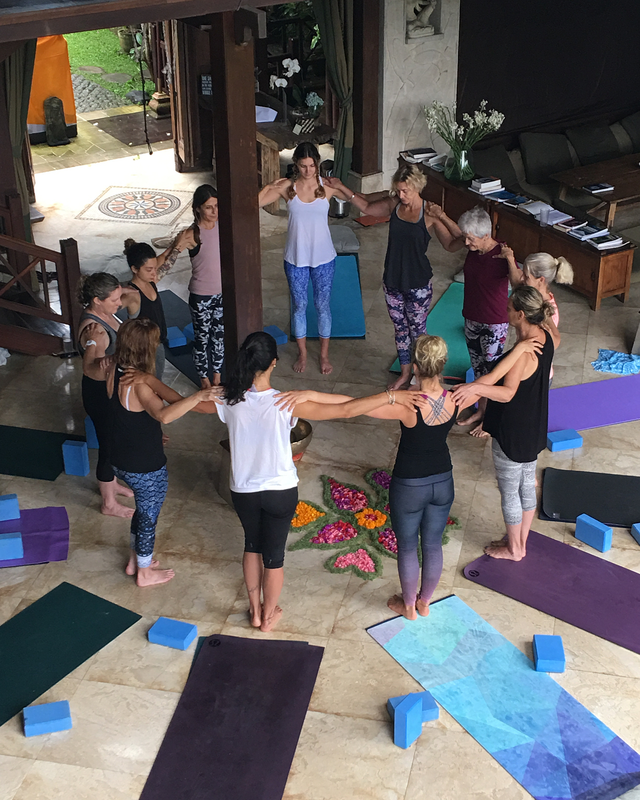 For those looking to teach, this Yoga Teacher Training in Costa Rica will provide a vast, comprehensive tool-kit for teaching physical postures, alignment, adjustments and sequencing methodologies, as well as pranayama, mantra, meditation, and more. The principles we instruct can be applied to any style of yoga you feel compelled to offer. 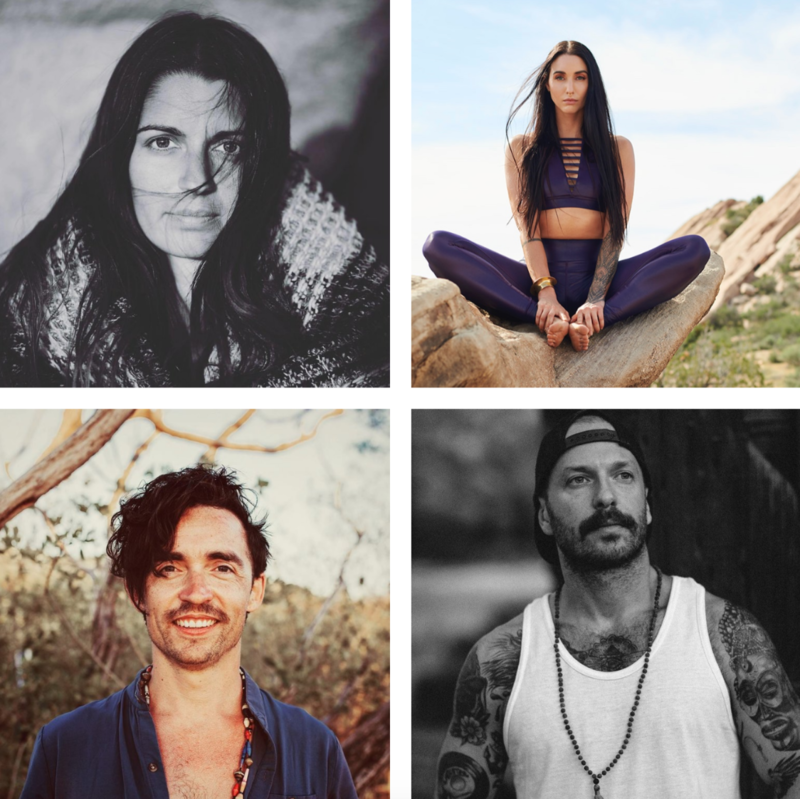 We are incredibly honored to welcome Clayton Horton back to Gaia Retreat Center along with Tryphena Chia of Pure Yoga on Nov 6-10 for an invigorating & uplifting Ashtanga / Baptiste Yoga Retreat. Clayton is an experienced and internationally known KPJAYI Certified Ashtanga yoga teacher who discovered yoga at age 21 whilst living in San Francisco, when his mother took him to a pranayama class. Clayton studied with masters Sri K. Pattabhi Jois and the Greensufi for many years, both of whom gave him great inspiration to practise daily and develop a yogic lifestyle. Whilst attending a course for teachers in Mysore during the summer of 2016, Sharath Jois awarded Clayton with the blessing of ‘Certification’ – the highest level of accreditation for teachers at the institute. Clayton’s teaching style is traditional, yet light-hearted and relaxed - complete and well-balanced in which an experienced and skilled teacher can help any student 'find their place' within its structure regardless of individual challenges, aptitude and constitution. Tryphena is thankful to have found Baron Baptiste and Sri Dharma Mittra as her teachers. Baron has helped Tryphena to be fearless in stepping up to her fullest potential. Sri Dharma Mittra has taught Tryphena to have compassion for everyone and to be the first person to stand up to help anyone in need. Tryphena believes in having fun and allowing ourselves to make mistakes on the yoga mat. Her classes can be challenging but they are fun and creative. 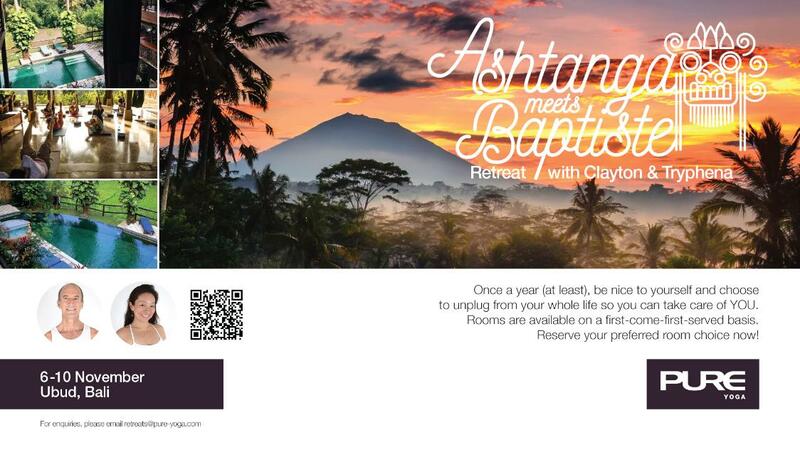 Expect daily Simple Led Ashtanga practice with Clayton, Baptiste Power Vinyasa practice with Tryphena, Afternoon Restorative & Yin Yoga combined with delicious meals, excursion to Tirta Empul holy water spiritual cleanse and plenty of free time in our beautiful sanctuary & explore markets, restaurants and more. Once a year (at least), be nice to yourself and choose to unplug from your whole life so you can take care of YOU. This co-facilitated retreat is open to all levels and backgrounds! Join two dear friends (and experienced Yoga teachers and facilitators), Marta Wanderlust + Michaela Westermark, for an end-of-the-year retreat in the magical Bali: a week to remember, re-awaken and consciously enter into the new. Come along for a journey of movement, transformative Breathwork, somatic practices, meditation, sound and ritual, cacao ceremony, nourishing food and stunning nature. Closing the year by lovingly letting go + creating more space internally, and then consciously entering into the new on a magical land, unsurprisingly known as the Island of Gods. Before setting roots in Bali from Stockholm, Michaela spent years in India where she immersed herself in Asana, Pranayama and Vedic philosophy. Drawing upon the ancient teachings to infuse a practice based in the relevance of everyday life. Amongst other great teachers she has trained and studied with Cameron Shayne (Budokon & Mixed Movements Arts), Edward Clarke (Tripsichore Yoga), Usha Devi (Iyengar), Meghan Currie and Sudhir Rishi (Vedic Philosophy). Marta is a gifted, passionate, and highly experienced teacher and student of Yoga and the teachings of Advaita Vedanta. She has first discovered Yoga when 14 years old, and right away felt the mysterious familiarity of the practice. She began her professional training with a Jivamukti Yoga immersion, under the guidance of Yogeswari – one of the most senior teachers of the method. Marta was certified as an Ashtanga and Vinyasa Flow instructor in a traditional school in Goa, India. In India, she also had the privilege to meet her Spiritual teacher Rishi Sudhir of Tiruvannamalai, with decades of experience in Pranayama, meditation, and a depth of Vedic knowledge. Over the last years, Marta has been studying with the plant medicines and traditions of Central and South America.